Let me tell you a bit about John Calvin. First of all, like our Savior and the Holy Family in Egypt, and a host of people before and afterwards, he was a refugee. The events of the early 16th Century in Europe created lots of refugees. There were refugees fleeing Muslim armies in Eastern Europe. But there were also refugees from all over Europe: Protestants fleeing areas controlled by Roman Catholics and Catholics fleeing areas controlled by Protestants. Jews fleeing the inquisition in Spain. Calvin was one of many. Calvin had been trained in the classics. His first book was a commentary on the Roman philosopher Seneca. He was a Frenchman who converted to the Protestant faith in the early 1530s and immediately found himself a wanted man. France was always hostile toward Protestants as the world witnessed later in the 16th Century with the St. Bartholomew’s Day Massacre. Surrounded by hostility, Calvin headed to German to study under Luther and other Protestant teachers. Along the way stopped overnight in the Swiss city of Geneva. There, he was persuaded by the William Farel to stay in the city and help in its reformation. With the exception of a few years, Calvin would spend the rest of his life in Geneva. Unlike the parody of Calvin that has been instilled in the modern mind, he was far from being a sourpuss theologian. He was joyous, despite suffering grief. He loved his wife dearly and was heartbroken to have no children to survive infancy. Her death was also a blow. Yet, he was known to by friends to be witty and joyous. Certainly, compared to our standards, 16th Century Geneva was a dreary place. Even though there were miscarriages of justice in the city, it was a source of enlightenment during the 16th Century. The auto-de-fes of the Spanish inquisition, the chaining together of the poor, and driving them from the city as happened in Paris, and the witchcraft mania that affected much of Europe during this era were mostly absent in Geneva. Although he had been trained as a scholar, Calvin’s belief was that theology must have practical implications. The purpose of theology and Bible Study was to inform our lives on how we should live in a manner that would bring glory to God. At the heart of his theology is a focus on an Almighty and All-loving God from whom our blessings flow. Our lives are to be lived out reflecting God’s goodness and mercy. This includes giving to the poor, taking care of the needy, and through our honest and hard work, glorifying our Creator. 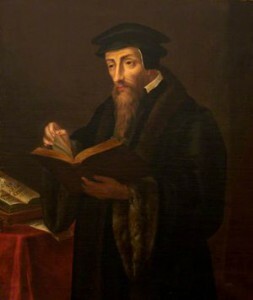 Calvin’s arranged the church in Geneva in a fashion that allowed laypeople to be involved with clergy in decisions of the church. He also organized Deacons who cared of those in need and visited those in hospitals. The population of Geneva in middle of the 16th Century mushroomed with refugees and Calvin and the church sought ways to handle this influx. Yes, even like today, there was controversy over how to handle the refugees, but Calvin insisted they be merciful toward them. A hospital was established for refugees, and Calvin organized an academy where refugees were educated. Many of these would become second and third generation Reformation leaders, such as John Knox who led the Reformation in Scotland, creating the Presbyterian Church. Interestingly, this school’s was tuition free (as was all education for the poor of Geneva). Because of the effort of those like John Calvin, Presbyterian and Reform Churches have always been at the forefront of educational efforts, pushing in the 19th Century for universal public schools and establishing way more colleges and universities than our numbers would suggest. Education is still important. Sadly, we have forgotten Calvin’s role in working on behalf of immigrants. I wonder how he might respond to the refugee crisis today. I am sure he’d encourage us to be compassionate in our response, and to do whatever we do for the glory of God who, throughout the Old Testament continually lifts up the orphan, widow, and the foreigners in our midst for special care. Interesting read with lessons to be learned. I guess I’m like the people you referred to in thinking Calvin a rather drab religious figure. It must be those dark oscuro paintings in museums. It would be well for us to read about the refugees of those Calvin days to understand that some things never change, they just become more widely and quickly known in these times.